This stunning bird allowed us to approach as it casually sat there. It had obviously just finished a meal as part of its lunch was still hanging from its talons. 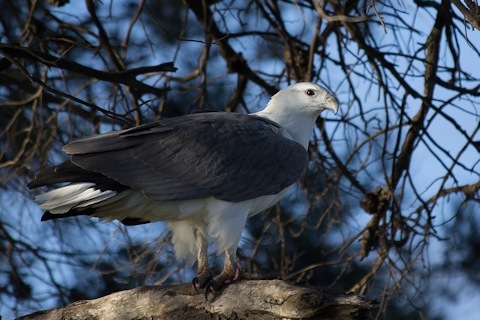 "..Sea Eagles do not eat only fish. They are responsible for killing large numbers of rabbits and take whatever small mammals come their way. Doubtless Eastern Water Rats and perhaps even a Platypus would be included in the catch. Certainly these mammals live in inland areas also frequented by Sea Eagles. The eagles eat carrion too and may be seen occasionally on dead lambs or other stock, or eating shot or road-killed kangaroos. They also take birds, particularly waterbirds such as ducks, swamphens, coots and swimming cormorants. *Simpson, Ken (1972). Birds in Bass Strait. A.H. & A.W. Reed Pty Ltd, p.100.